Take some ordinary clay pots and turn them into decorative and useful items for your home and garden. Many of these projects are simple enough to complete in one afternoon! You can purchase fairly inexpensive clay pots at any home and garden center, and they are available in a wide variety of styles and sizes. The following projects offer nice examples of just how uncommon a common clay pot can be. Have fun getting in touch with your creative side! This project makes an inviting message for your yard or front patio. You can leave the pots empty or fill them with flowers if you like. Seal the inside of each pot, and let the entire set dry as directed on the label. Paint each pot whichever color you choose and let the entire set dry. Paint one letter of WELCOME on each pot. When the letters are dry, seal the pots one last time. Painting a beautiful or whimsical design on a clay pot is one of the easiest projects you can do. Consider who will own the pot or which room will house it, and then get to work. Wipe off the pot with a damp cloth and let it dry. Seal the inside of the pot with the polyurethane sealer to prevent it from cracking during outdoor use. Dry according to the label's directions. Paint the pot as you desire. This can simply be a solid color, or you can add checks, curlicues, flowers or any pattern you like. Allow the pot to dry completely and then add a coat of acrylic sealer to protect the paint. When the pot is completely dry you can plant flowers in it, or use it for storing small items. 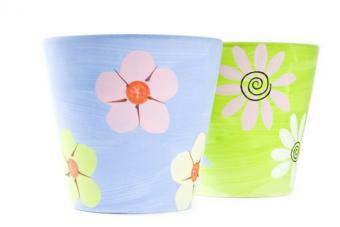 You can also use these decorated pots as containers for gift baskets. 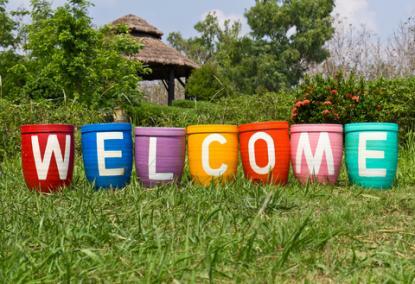 For the gardener in your family, there is no better gift than a beautiful clay pot filled with gardening tools, seed packets, gloves, and a gardening book. 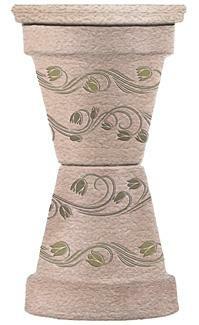 Use natural raffia to tie a big bow around the pot and attach a special gift card for the recipient. You'll need at least a little painting skill to create the face and clothing for this project. You can use the image on the right as a pattern, or use your own imagination to make your person unique. Seal all the pottery and let it dry according to the directions on the label. Turn one 10-inch pot upside down, and paint on the shirt and overalls to create the body. Seal the paint after it dries. Cut 2 lengths of jute, 24-inches in length each. Thread one bead onto one cord and push it to the middle, gathering both ends of the cord in one hand. Thread both ends of the cord through the hole in one of the 2-inch pots. Add another bead to one end of the cord, push it down to meet the first pot, and then thread both ends of the cord through another 2-inch pot. This makes one arm. Repeat steps 5, 6 and 7 to create the second arm. Thread all four cord ends through the hole in the body pot, and then thread them through the 3-inch bead on the inside of the pot. Leave enough length on the cords so the pot arms hang just beyond the edge of the bottom pot. This will keep them clear of the head pot when you attach it. Once you have your arms placed where you want them, tie a secure knot with the loose ends on the other side of the bead to hold it in place. Cut off any excess cord. Run a ring of epoxy glue around the edge of the body pot, and place the head pot on top. Allow it to dry. When the glue is totally dry, lift your person by the bottom pot and set it in the saucer. 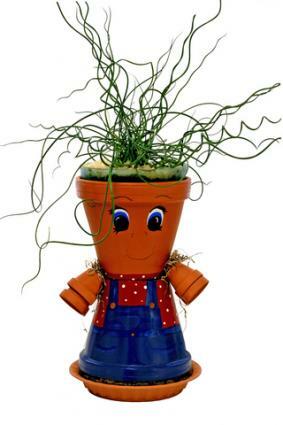 Set a potted fern inside the head for your person's hair, and place it in your garden. This project is actually very easy to complete. You can leave your pots plain terra cotta, or you can paint them to customize your birdbath. Wipe down the pots and saucer with a damp cloth and let them dry. Seal all the pottery pieces to protect them from cracking. Glue the bottoms of the two 16-inch pots together to create a base for the saucer. Let dry as directed on the glue label. Paint the base as you desire, let it dry, seal it to protect the paint, and let it dry again. Tie the raffia around the center of the base to hide the seam. Paint the saucer as you wish, let it dry, seal it, and let it dry again. Place the base on a level surface in your garden, and center the saucer on top of it. You can glue it to the base, but it's easier to make frequent water changes if you don't. Fill the saucer with water, and wait for the birds to discover it. If you have a bit more time to spend on your project or you're looking for a craft that you can do with an older child, consider making mosaic flower pot crafts. Cover your work area with newspaper and sort through your pottery, beads, charms, tiles and other embellishments to decide what items you want to use in your mosaic. Be very careful when working with items that may have sharp edges. Use your plastic knife to spread a thick layer of the ceramic tile grout onto your terra cotta flower pot. 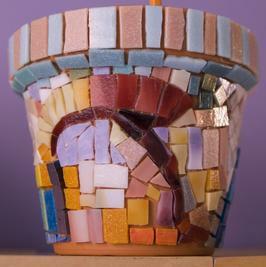 Press your mosaic pieces into the grout, arranging them in a pleasing pattern. If needed, add more grout to cover any sharp edges in the mosaic. When the pot is completely dry, wipe it with a damp sponge to remove any residue from the grout. These wind chimes add a whimsical touch to your garden or patio. This is an enjoyable project that could turn into an afternoon of family fun. Just buy a clay pot for each member of the family and allow them to decorate it to represent themselves. If you have more than four in your family, make two wind chimes. Paint the outside of the pot your chosen base color. Paint each pot a different color if you like. Stencil the outside of each with your chosen design. Ivy leaves or geometric shapes work well for this. Cut one yard (three feet) of jute. Pull one end of it through a wooden bead and tie a knot. Tie a knot an inch or so up from the bead. Put another bead on that knot. Put the smallest clay pot on the jute and pull it down to the bead. The next largest pot will hang halfway over the smallest pot. Where you knot it and put the bead will depend on what you need to make it fit right. Measure it, knot the jute and add another bead. Add the next larger pot. Repeat steps until all four pots are used. Make a loop in the top for hanging. You can modify any of these projects to put your own personal spin on them, and they can make wonderful gifts for family and friends. Get creative with the distinctive shape of terra cotta pots to create eye-catching and unique project ideas.